⚠️ Found a bug or want a new feature? Report it on GitHub. 🌏 Can you help translate Dectorio? Visit CrowdIn to get started. ⁉️ Have a different question? Visit the FAQ for detailed information about common queries. Dectorio is a large mod that adds decorative elements to beautify your factory. 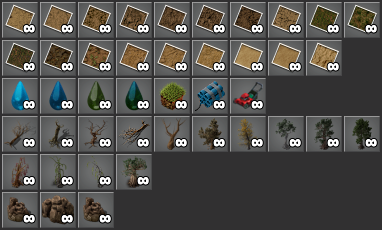 New technology research is required to unlock the various items before they can be crafted and some default recipes are adjusted to better reflect how these items should be made. Inspiration for the mod came from a lot of other mods on the portal, although all the assets in Dectorio have been custom made for this mod and are either modified versions of base game assets or created from scratch. If you'd like to use any of these in your own mod, please observe the GNU GPLv3 license. Requires Factorio version 0.15 or later. 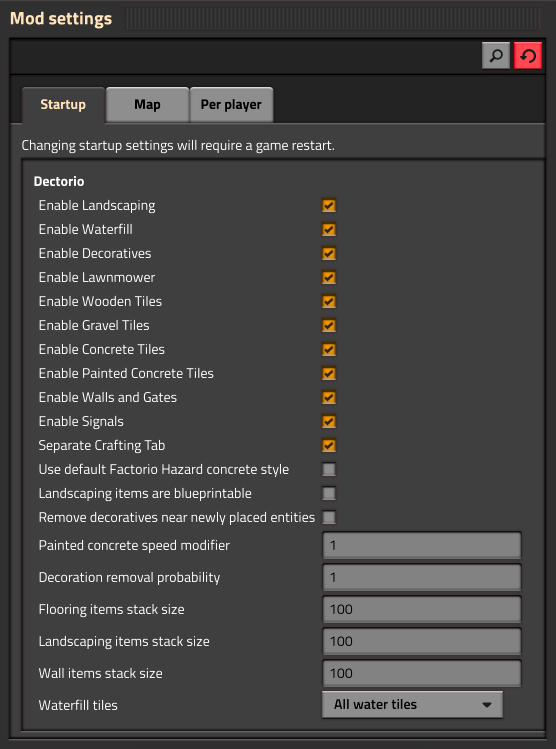 Includes settings for enabling or disabling each of the above features (Options > Mods > Startup). Ideally these should only be changed before starting a new game. Changes on existing games will require content to be migrated and some items may be lost if you disable components you've already used on an existing save. Always make a backup first! Check out the Mod Spotlight video by Xterminator to see the mod in action (note that this features an older version of Dectorio without some of the features mentioned above). 🇩🇪 German players may be interested in this Mod Monday video by SeeNo. Feel free to get in touch with any issues or suggestions for new features you'd like to see. You can get in contact via the GitHub issues page at https://git.io/DectorioIssues. I'm also occasionally online on the Factorio Discord or Forums. Dectorio uses CrowdIn to allow the community to translate the mod from English into various languages. If you are able to translate the mod into another language, please visit the Dectorio project on CrowdIn to help with the translation effort. Requests for new languages are welcome! Special thanks to the translators below (in no particular order). Chinese Simplified (87%) - jessefjxm. Czech (64%) - dereksp and Meritic. German (100%) - seeba8, ST-DDT, LastDawn and lpzockerx. Portuguese, Brazilian (100%) - celaquila. Russian (94%) - nastyslave, diraria, scheugen86, antonus777 and schmarotzerltd. Note: If playing with Factorio 0.15, please download v0.7.6, or for Factorio 0.16, please download v0.8.11 as these are the last stable versions supported on these base game releases. 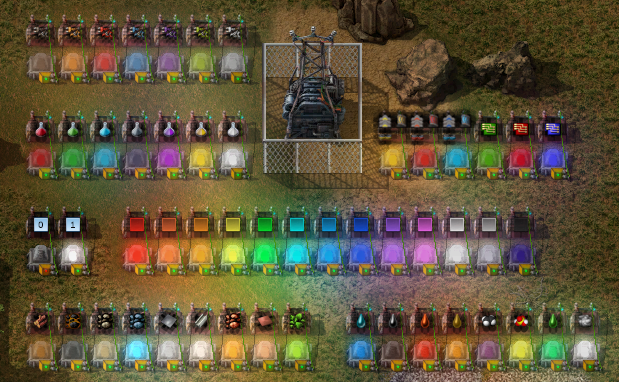 v0.9.0 and later are only supported on Factorio 0.17. Limited testing has been completed with other mods. Warnings will be shown in-game to highlight any known issues. If you come across a specific compatibility issue, please let me know and I'll see what I can do to fix it. 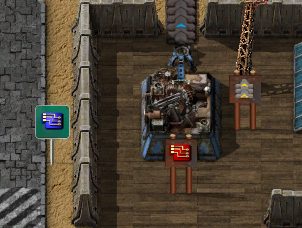 It is not recommended to use other coloured signal mods at the same time as Dectorio. This can cause coloured signals to be overwritten multiple times and lead to game-breaking compatibility issues with other mods. 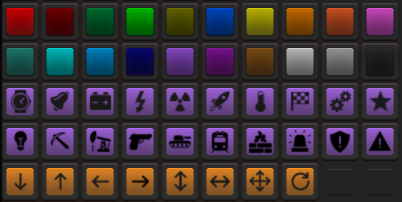 If you would like more colours, you can add these in the Dectorio config.lua file (instructions are in the file). For full details, visit the FAQ. 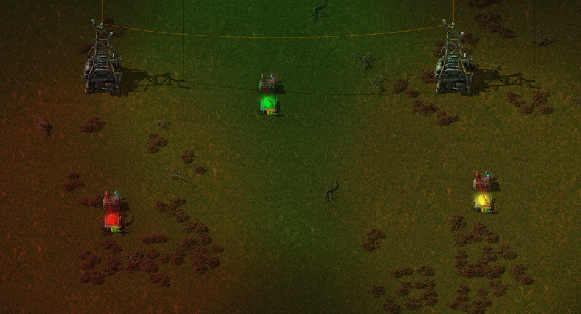 Dectorio includes specific support for Alien Biomes. Other mods with additional Dectorio support (thanks! ): Concreep, Fully Automated Rail Layer (FARL), Pavement Drive Assist. Other decorative mods worth checking out (all compatible with Dectorio): Arborium, Asphalt Roads, Beautiful Bridge Railway, Color Coding, Naked Rails, Reinforced Walls. Mods with known compatibility issues with Dectorio (either don't install these, or edit your mod settings and disable the conflicting components in Dectorio): Thaumaturgic Machinations and Expanded Color Lamps.